Two weeks ago the Copyright Society of China (also known as the China Copyright Association) launched its new 12426 Copyright Monitoring Center, which is dedicated to scanning the Chinese Internet for evidence of copyright infringement. This frightening panopticon is said to be able to monitor video, music and images found on "mainstream audio and video sites and graphic portals, small and medium vertical websites, community platforms, cloud and P2P sites, SmartTV, external set-top boxes, aggregation apps, and so on." When it finds content that matches material submitted to it by a copyright holder, the Center provides them with a streamlined notification and takedown machine, from the issuance of warning notices through to the provision of mediation services. The Center's technology service provider also provides platforms with filtering technology that can allow infringing materials to be blocked from upload or download to begin with, obviating the need for a separate takedown procedure. The Copyright Society of China, which instituted the 12426 initiative, is formally a private association, and lists amongst the venture's partners American media companies such as 21st Century Fox and Warner Bros. On the other hand, the Society is headed by a representative of the National Congress of the Communist Party of China, and includes within its mission "to provide technical support for the government to carry out network copyright supervision according to law." The 12426 service utilizes proprietary commercial technology for its copyright monitoring, and much of the same technology is used by Chinese Internet companies for complying with Chinese government mandates for political censorship. For example, earlier this month it came to light that the Chinese government, at least at a provincial level and possibly at a national level, requires every provider of non-residential public Wifi hotspots to monitor and record their users' activity. This is in addition to the well-documented surveillance and censorship of Chinese online platforms such as Weibo and WeChat. 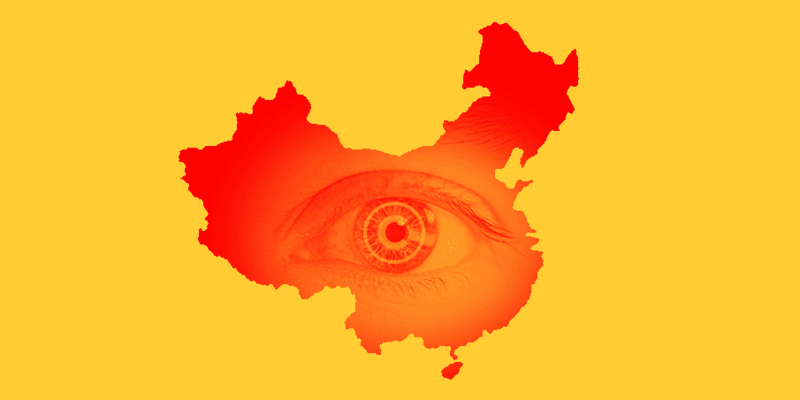 Although this stifling surveillance machine is a human rights crisis in its own right for China's 720 million Internet users, it also provides a cautionary tale for the West, where copyright holder lobbyists are advocating for very similar filtering and surveillance mechanisms to be made mandatory. In that sense, China's copyright surveillance machine of today may warn of the European or American Internet of tomorrow. For example, it is thanks to the copyright industry that German Wifi network operators are required to password-protect their networks to prevent them being used by anonymous users (who might infringe copyright). And in Europe right now, a current proposal would require user content platforms to filter uploads for material that copyright holders claim to be infringing. This European proposal would put into place exactly the same kind of filtering that China's copyright surveillance industry provides today, repurposing technologies that the authoritarian regime also uses for the repression of political dissent. And this kind of repurposing goes both ways—technologies and legal processes developed in the first instance for copyright enforcement are also misused for political censorship and repression. Another uncomfortable similarity between the Chinese Internet censorship regime and developments in the West is the close intermingling of public and private initiatives. Just as the Chinese Community Party sits at the head of the Copyright Society of China, so too the heavy hand of government can be found behind many notionally self-regulatory industry schemes from North America and Europe that aim to address copyright infringement. These government-led arrangements, that we call Shadow Regulation, are notoriously lacking in transparency, accountability, and user participation. The above mentioned European proposal, which pushes platforms and copyright owners into "voluntary" agreements concerning upload filtering, is a textbook case in point. The announcement of China's government-linked 12426 Copyright Monitoring Center is absolutely chilling. It is just as chilling that the governments of the United States and Europe are being lobbied by copyright holders to follow China's lead. Although this call is being heard on both sides of the Atlantic, it has gained the most ground in Europe, where it needs to be urgently stopped in its tracks. Europeans can learn more and speak out against these draconian censorship demands at the Save the Meme campaign website.